The arrival of noveau-riche Anzhi Makhachkala, the so-called "Manchester City of Russia", and the departure of much-loved Spartak Moscow captain Andrey Tikhonov, swapping his boots for the trainer’s tracksuit, throw the contrasts of Russian football into sharp relief. Tikhonov, who made his last appearance for the Red-and-Whites on Sunday in a 3-0 win against Krylia Sovetov Samara, was perhaps the last bridge back to the rapid transition of the game following the break-up of the USSR. He made his debut in October of 1992, at a time when the CIS had just represented the region in a European Championship and the last Soviet team was re-emerging in the colours of various new names on the footballing map. It was not just countries which were appearing though: the creation of a new league system meant rapid elevation for some provincial clubs as Soviet minnows became big fish in their smaller domestic leagues. And, almost unnoticed, in the depths of Dagestan a new club was formed to rival the local, if unimpressive, Dynamo Makhachkala. That club, Anzhi, is now aiming to overthrow the traditional rulers of Russia’s game – and then conquer Europe. Footage of Tikhonov’s career focuses on the 1990s when he captained Spartak and was their key player as they dominated the early years of the Russian league. With 263 appearances and 91 goals, the creative midfielder helped the club win eight titles and two cups. Many feel it is no coincidence that his departure to Krylia Sovetov in 2000 has been followed by a fallow period, with no title for the club since 2001. Like so much of the recent past though, the images of Tikhonov cutting a swathe through the defences of Alania Vladikavkaz, Uralan Elista, Chernomorets Novorossiysk or other low-fallen top-flight clubs feels an age away from modern Russian football. At a time when the country’s sports stars were reveling in the freedom to take up contracts elsewhere – and escape the shattered local economy where salaries were low even when players could be confident they would be paid – Tikhonov stayed at home. While current Spartak head coach Valery Karpin was starring in Spain, his goals were filmed under grey skies on pitches of brown and pale green. Nowadays, when Russian TV needs an image of drab and underdeveloped it tends to pick on provincial cities like Makhachkala. Even without the baleful scourge of terrorism which stalks Dagestan, the republic and its capital would struggle to make itself a major centre. Remote from the bright lights of Moscow, tucked in the mountains on the southern frontier with Azerbaijan, this is a region which thinks of itself in terms of hardy hill-farmers. It is not a land for city slickers, which makes Anzhi’s quixotic quest for glory all the more remarkable. Yet that same quest chimes strongly with Russia’s ongoing mission to reinvent itself through top-level sport: like the Sochi 2014 Olympics, the 2018 World Cup and a host of other high-profile events, Anzhi’s stated ambition of winning the Champions League is something of a national project. Take the circumstances in which Suleyman Kerimov, valued at $7.8 billion by Forbes, was handed the club by the Dagestan authorities back in January. The billionaire, a local lad, was given total control of a club now back in Russia’s top flight in return for spending guarantees to redevelop the sporting infrastructure and build a winning team. He spoke warmly of building a team which would make Dagestan proud. A month after that deal was done, an entirely separate court ruling reversed the freezing of several of Kerimov’s business assets, previously caught up in a row over the expensive and long-running redevelopment of a downtown Moscow hotel. Coming at the same time as the Kremlin was unveiling ambitious proposals to regenerate the entire North Caucasus using a mixture of sport and tourism, hoping to strangle terrorist networks in a virtuous circle of rising prosperity and reduced disaffection, Kerimov’s arrival was well-timed. 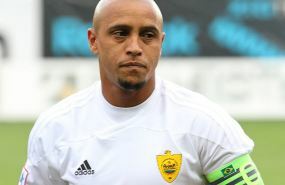 What has followed is well-known: Roberto Carlos was the first high-profile recruit back in January, and his warm words about the club have since helped the signing of fellow Brazilian Diego Tardelli, rising Hungarian star Balazs Dzsudzsak and returning Russian international Yuri Zhirkov. But it was capture of Samuel Eto’o from Inter, on a contract believed to be worth up to €20M a year, which really captured the imagination. Buoyed by that transfer coup, which garnered global media coverage for a team which rarely makes the back page in its homeland, the next step is rumoured to be swoops for England pair Frank Lampard and Steven Gerrard. At 30, and with a trio of Champions League winners medals in his trophy cabinet, Eto’o is a major world star who still has several good seasons ahead of him. His arrival is unlike the others: Carlos is a declining force, collecting a last big payday and acting as a cheerleading marquee signing, Dzsudzsak a youngster dazzled by a sizable contract and Zhirkov an unsettled Russian emigre happy to return home. But Eto’o is none of these: he could, presumably, have gone to any club in this year’s Champions League and picked up a generous wage while having a real prospect of adding to his honours board. Instead he picked Anzhi, officially because he was enthused by the prospect of building a footballing legacy in a deprived region. The money, in his words, is to become a means to do the same for his native Cameroon on his eventual retirement. However, several caveats remain. Since Eto’o arrived the team’s form has stuttered. While Spartak waved goodbye to Tikhonov with a 3-0 win which lifted them into the European places, Anzhi slipped to a 1-0 defeat at unheralded FC Krasnodar and now lie in eighth spot. Head coach Gadzhi Gadzhiev, a Dagestan native, is renowned for taking Anzhi to a best-ever fourth-placed finish and reaching the Russian Cup final with the side in the early 2000s. He also achieved similar feats on tight budgets at Krylia and the now-defunct Saturn, but his long career has never seen him take charge of such a star-studded squad. Tending to the whims of World Cup and Champions League winners may prove rather different from nursing assorted has-beens and hopefuls. At the same time, while Kerimov is determined to create a club of which his native region can be proud, at present the team spend as little time as possible in Makhachkala. Training takes place just outside Moscow at the base vacated by Saturn last November, and the team flies in for home games – a trip not dissimilar to flying from Moscow to London, and one which prompted allegations of an unpaid 25M rouble bill owed to Dagestan airlines. That story emerged the day before Eto’o confirmed his transfer from Inter and coincided with reports of a furious row between Gadzhiev and the referee at a match against Dynamo Moscow. In a land notorious for black PR, it is not hard to imagine a few green-eyed rivals at other clubs frantically looking for dirt to dish. Certainly that appeared to be the case when Sergei Stepashin, chairman of Russia’s Audit Chamber and head of Dynamo’s advisory panel launched a stinging attack on Anzhi’s spending policy. He argued that it was wrong of Kerimov to pour his personal wealth into a vanity project – however well meaning – in a region which is one of Russia’s poorest and most violent. The cash, he suggested, would be better spent rebuilding the fragmented social infrastructure and offering an alternative to unemployment, crime or terrorism while Dagestan is still receiving huge subsidies from the federal budget and the taxpayers’ purse. Similar sentiments, rather more crudely expressed, have come from supporters of Russia’s other clubs. Spartak’s "Fratria" fan club was the first to propose a boycott of games against Anzhi and their North Caucasus neighbours Terek Grozny and Spartak Nalchik. The argument was similar: tax dollars paid by honest Spartak fans were going directly or indirectly to subsidise their footballing rivals. The idea was taken up most enthusiastically by Zenit fans – ironically, considering the Petersburg club is bankrolled by the state-owned energy giant Gazprom – and public anger reached an unlikely peak following Zhirkov’s transfer. His first appearance after the deal was signed saw him represent Russia in a friendly against Serbia in Moscow where he was booed from his first touch until his 68th-minute substitution. Anzhi may have the financial muscle to start winning more football matches, but at the moment they are struggling to win the affections of fans outside of Dagestan.